That was my cry out to the Twitterverse about a week ago. Within minutes, I was tweeted a great deal of ideas (I mean so many that I didn’t even bother to count them). One of my favorite ideas was frozen yogurt. Oh, how I love the stuff. So, after deciding I would make some frozen yogurt, I had to come up with a recipe. 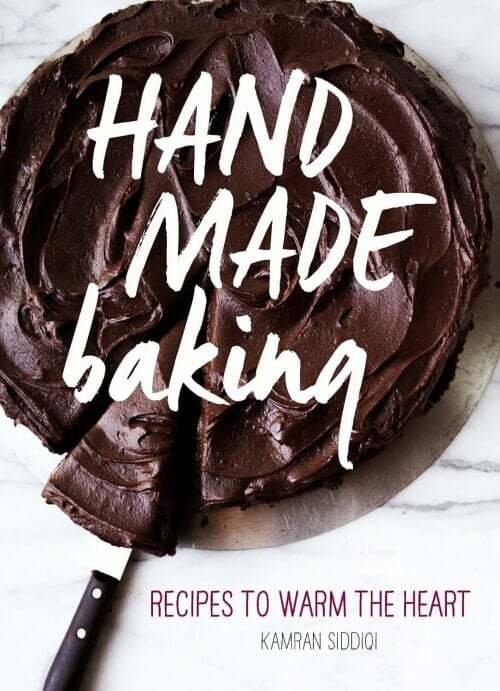 Oh, not just any recipe. A recipe made without an ice cream maker. Yes, I said frozen yogurt without an ice cream maker! Did I mention this was a mango frozen yogurt? Yep. Not only did I have 5 pounds of organic plain yogurt in the fridge, but I also had about 15 mangos (Dare I say where I obtained both of these things from?). I had to put them to use somehow. Of course, this recipe does not call for a 5 pound tub of organic plain yogurt or 15 mangos. Don’t worry, I didn’t use all of that to make frozen yogurt. I promise! So, what’s the secret to making good frozen yogurt without an ice cream machine? Mix, mix, and mix. Okay, I’ll put that into English…. About 45 minutes into freezing, you’ll want to whisk the mixture (By the way, I found this method on David Lebovitz’ site). 1 hour and 15 minutes into the freezing, whisk again. And 1 hour and 45 minutes into freezing, whisk again. Yeah, I know, a lot of whisking… But this will allow for a creamier frozen yogurt. As you can see, my frozen yogurt in the photo is not fully frozen. Well, I’ll tell you why. I like semi-frozen ice cream (I guess you’d call it soft…) and frozen yogurt. I am serious. Sometimes I go as far as popping my ice cream in the microwave for a couple seconds just to get it soft and a bit melted. The other reason is because I took the photo when it was semi-frozen (the photo above) and when it was fully frozen and I liked the results of the semi-frozen photo. Also, for some odd (but great) reason, my recipe tastes like a frozen mango lassi. Oh, but wait. See those pistachios on top? You have to try this recipe with the pistachios on top! They’re divine with this mango fro yo. It gives it such a great crunch when you’re eating the ice cream and it tastes good too. Oh, did I mention it looks good on top of the frozen yogurt? But I didn’t have to say that. Did I? This recipe is so simple that it’s kind of like a sin to put up on this blog. Oh, well, this sinful treat is well worth the little effort that you have to put into making it. Place all of the ingredients in a blender and blend until smooth. About two minutes. Place the mango yogurt mixture in a bowl that is safe enough to go in the freezer. 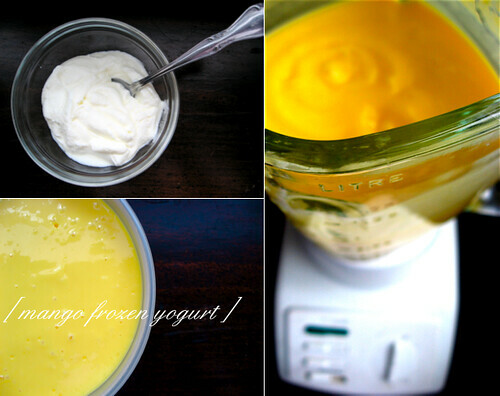 Place the bowl of mango yogurt mixture in the freezer, cover it, and set your timer to 45 minutes. 45 minutes into freezing whisk vigorously (be sure to whisk the mixture and not use a fork) 1 hour and 15 minutes into the freezing, whisk vigorously (again) and then do the same thing 1 hour and 45 minutes into freezing. Allow the mixture to freeze. 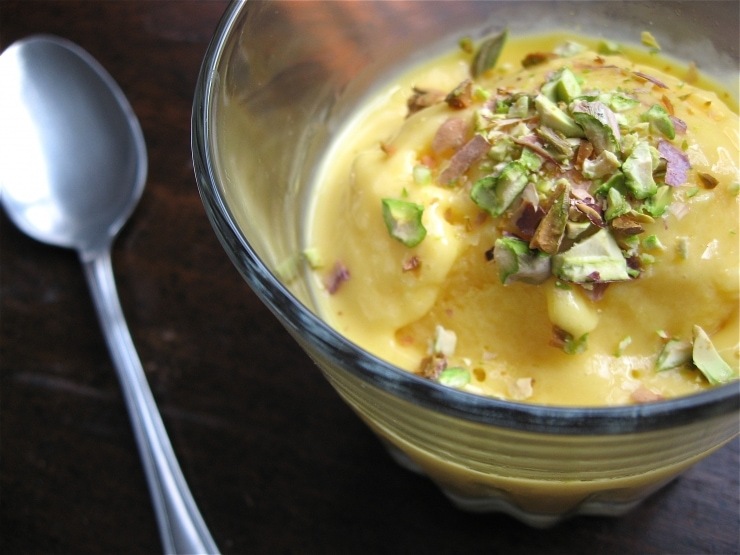 After the mixture has frozen, scoop some of the Mango Frozen Yogurt out, place it in a couple of bowls, and top it with some crushed pistachios (topping it with pistachios is optional, but it does make a great addition to Mango Frozen Yogurt). This looks delish. I found your blog through smitten kitchen. I love love love fro yo and I will try it out when I can get my hands on some good mangoes. Found your blog through summertomato and think that your photos look fab. This sounds delicious, and with the pistachios on top… divine! I’m going to have to try this before summer’s up! The stone/pi/seed out of the middle of the mango broke the blades of my blender how did you manage to blend the stone/pi/seed??? Barb, you do not use the core of the mango, you cut around it when you dice it. Am in the process of making some now; used my creamy full fat home made yoghurt, Bowen mangoes and am going to top it off with some crushed local organic macadamias. But any advice on how long you should spend whisking it in-between freezing? Hi Shamain- Until it’s smooth. You can also do the same thing in the food processor / blender. I hope that helps! Having just made five cups of frozen yogurt my way, I thought I would look up a recipe and found this one. What I like about this one is that it seems to be semi soft and creamier when served while mine is more frozen. I have to nuke it on defrost for a minute or two to soften it up. I will try yours next time though being calories conscious, I will use Splenda to taste, 2% yogurt and fat-free milk that tastes like 2%. Loved the pistachios look! THis was amazing and so easy. We inaugurated our ice-cream machine with this recipe. The result was so good that my 3-year-old decided ot have this for dinner! Hi Louise, 1 cup is approximately 2.4 dL. I hope that helps! Try it in an ice cream maker & add cracked black pepper – sounds odd – tastes divine. Great recipe, and as soon as I saw your recipe I HAD to try it. My mango yogurt tastes so good! On the flip side, it doesn’t freeze so well. It crystallized! Doubt: how can I avoid that? I used toned milk, could that be the reason? This looks great, love the pistachios on top! Im sure it gives a nice crunch to all that smooth mango froyo. Thanks for sharing! Try mango pulp in a can, with yoghurt and condensed milk. Yummy!